Daniel Rose poses fundamental questions about tefillah education, exploring as well differences between different age levels. In the process he also focuses on how the choice of siddur can impact on the student experience. On one visit to a North American Yeshiva day school, I started my day by joining the students for tefillah. I always enjoy experiencing tefillah in schools both as an amateur sociologist and as an educator invested in tefillah education. This particular school tefillah, just high school boys in this instance, was in no way distinct from my own experience. Decorum was generally not terrible, almost all the boys had managed to bring their tefillin and find siddurim to hold, and most of them even had them open. There were a number talking in hushed tones, one boy cramming for a test he no doubt had during first period, with his science notes miraculously undetectable under the table at which he was sitting. Another had his head down on the desk, perhaps asleep, perhaps daydreaming. And then, of course, there were many boys, perhaps even a majority, saying the words from their siddurim. The students in this school come from a parent community generally committed to tefillah as a value, and many of their sons were engaged in the act of tefillah as was required – by halakhah, by the school, and by their Jewish conscience (Lehmann, 2010 saw similar behavior models in her research). Then there were the tefillah leaders and role models (teachers and counsellors) charged with facilitating this tefillah enterprise. They modeled a committed tefillah engagement of their own, as they pretended not to notice the boy with his head down and his friend intently studying for his test, but interacted with the boys who were talking, in a friendly manner, trying to convince them to engage, or at the very least abstain from obstructing those of their classmates who were engaged in the tefillah. When I later shared my observations with the administrator I was there to meet, he said in a mildly defensive tone, “I would venture that we have a more positive daily tefillah than the majority of day schools you could name.” And I think he was probably right. I guess it depends where we put the goal posts. What are our goals for tefillah in our schools? Is this the best we can hope for? Is anyone getting it better? How are we preparing our students for “adult tefillah” in high school or in the elementary and junior high grades? And how can we improve? I don’t know if anyone has all the answers. I hope that some of us have some answers, so we can help each other as an educational community to move forward in this most challenging area of day school Jewish Education. I have no more experience in tefillah education than anyone else, and have certainly had no more success in that realm as a day school educator. But I have been blessed with the opportunity, through the serendipity of an exciting professional opportunity offered to me, to think creatively about tefillah education, and to visit and speak to many (but not enough) fellow tefillah educators. Allow me to share my thoughts until this point in my journey. Believing as the core value of a tefillah education program is where keva (tefillah skills mastery, or “tefillah literacy”) are sacrificed in order to focus on kavvanah (emotional and spiritual meaning-making). Behaving is the opposite of this, where tefillah literacy is the end goal – students should graduate the system with competency in the matbe’a tefillah, the choreography of tefillah, the halakhot of tefillah, and comfort with reading the words of the liturgy, etc. – what Rabbi Dr. Jay Goldmintz describes as “educating a sense of obligation” (2010). This is the keva of tefillah. The third core value of tefillah education she found was “belonging” where building community and creating a sense of belonging is the ultimate goal of tefillah education. This system focuses on values such as how to behave in the sanctuary, how to treat others in the community, and how to feel connected to the larger congregation (perhaps we should call this kehillah, to correspond with kavvanah and keva). My sense is that while this third value, kehillah, is unquestionably worthy of any educational program of Judaic studies, and one would hope be present in a significant way in our day schools, when it comes to tefillah education, we can probably categorize any given day school tefillah program as either focused largely on kavannah or keva. What’s happening at the chalkface? There is a paucity of research on tefillah in day schools. It cannot be said that what actually happens across the hundreds of schools that actively engage in tefillah on a regular basis has been sufficiently recorded and is therefore known with certainty. The following is therefore based on anecdotal evidence from both personal and secondary experience. This is by far the most positive stage of tefillah programs where students are on the whole engaged and connected to the tefillah experience (although it is fair to say that as each grade goes by on the relentless march towards middle school this becomes less and less the case). The more traditional and/or Orthodox the school and parent community, the more the focus is on tefillah literacy and skills acquisition, preparing students for socialization into the parent community and the adult prayer service. Singing is often central to tefillah in elementary grades, which both makes the experience pleasurable for the students (who like to sing) and achieving the goal of familiarity with the words of the liturgy, but without either a cognitive or emotional connection to the meaning behind the words (Wachs, 2009; Golombek, 2011). It can be argued, however, that song encourages learning the words by rote without actually encouraging an improvement in reading skills, and therefore some schools will also use tefillah as an opportunity for reading practice, at the expense of enjoyable singing (Goldberg, 2014). In the early grades, students will also learn the choreography of tefillah, and begin to become acquainted with the structure of the siddur and the tefillah service. Those schools that still have regular tefillah in middle school will more than likely be providing a tefillah experience that is closer in nature to the adult community of the school, both in terms of the physical setup of the service and the liturgy chosen (for example those prayers that require a quorum). This also gives the students their first exposure to tefillah role models – teachers and counsellors who model their own commitment and engagement in tefillah (Goldmintz, 2010). However, middle school services are often a challenging educational environment, where the students are no longer as compliant and cooperative as they were in their elementary grades, and where they are asked to engage in an activity lacking meaning for them (during a developmental stage where they are engaged in identity formation and connection making). This often leads to rebellion against the norms of tefillah to varying degrees (Golombek, 2011). Rarely are there middle schools that use tefillah time for meaning making activities, and few middle schools dedicate classroom time to tefillah education (Sigel, 2016). The more Orthodox the school, the more likely that the tefillah experience intends to replicate that of the parental community (for better and for worse). Some schools provide creative tefillah opportunities, allowing the students the choice to participate in non-conventional tefillah services (Wachs, 2012), others will implement a tefillah curriculum in the classroom to supplement and enrich the prayer services in the school, but the majority will not invest precious instructional hours on tefillah (Sigel, 2016). Tefillah role models become more important during this stage, but these will often function passively, modeling their tefillah engagement during the service, rather than engaging students in discussion or other pedagogic activities (Goldmintz, 2010). I once had a conversation with a tefillah education specialist that made a lasting impression on me. For this educator, tefillah literacy was the ultimate, and perhaps only, goal of his program – he readily acknowledged that the only important thing was that his students would have the skills to be able to be in synagogue and say kaddish for their parents when the time came. Another educator told me that he is not scared to be the most boring teacher in the school if it means his students graduate with the Jewish life skills they need, including how to navigate a siddur and feel comfortable in a synagogue service. There is no doubt that these goals are essential for Jewish continuity. But can we hope for more? I would argue that if we do not provide a meaningful connection, both spiritual, emotional, and intellectual, to tefillah, then it is likely the next time we see our graduates in a tefillah service will be when they need to say kaddish! Assuming that both goals, literacy and meaning-making, are possible K-12 tefillah program, what could that look like in practice? First, focus on the educator. Early in my career, I was proudly (passively) modeling my own engagement with tefillah, which involves for me an efficient and functional prayer experience with an additional Torah study component (redeeming the often plentiful “dead time” during a tefillah service). When the head of school noticed that I was learning parashat hashavua during the middle school tefillah, he later called me out on it (privately). For him, tefillah in school was like any other classroom period from the perspective of the teacher. It was not a time when the teacher went from active educator to passive role model. He felt that tefillah, like any other formal instructional period in the school time table, demanded the teacher to be an active educator, including preparation time, creative educational thought, and the focus of the class period to be the students. Second, I would argue that to add meaningful connection to tefillah for students we have to focus on creating educational opportunities to make the text and experience of tefillah relevant to 21st century lives, provide opportunities for spiritual experience and growth through tefillah, and foster relationshipbuilding with God through conversations about God (a focus that is often lacking in the rest of the Judaics curriculum). This will only happen when given serious educational thought by talented educators, willing to devote the appropriate time. Both goals lend themselves to either formal instruction in the classroom or informal instruction during tefillah time. This could be a full high school class in the philosophy of the siddur, a five minute daily devar tefillah given by the tefillah educator during the service, or once a week having a substantially abridged tefillah, and using the remaining time for overt tefillah education (or even cancel tefillah once a week). The options and potential formats are endless. And for the tefillah goals to be achieved, educational planning and investment is necessary like any other areas of the day school curriculum, including the creation of a tefillah curriculum. The choice of siddur can play a critical role as well. There is certainly value to giving young children an adult siddur, providing them with access to standardized texts tested by time and found throughout the Jewish world, thereby beginning their socialization into the Jewish community. But there is also a cost to this approach. Imagine the frustration and confusion if we were to give our first graders a 12th grade mathematics textbook, or a university science paper, or ask them to read a Shakespearean Sonnet. Isn’t that what we are in effect doing when we give them an adult siddur (or even the classic and popular “educational siddurim,” which in essence differ only in that some of the text appears in larger font, and there are line numbers)? Aren’t we saying to them: “Here is an adult prayer resource. It may be confusing and meaningless to you now, but someday it will make sense, and then you will really gain benefit from using it. In the meantime, let’s see what you can take from it anyway.” We don’t do this with any other subject within the curriculum, so why do we do it with a siddur, which is arguably the foremost guidebook to forming a relationship with God? By giving our students these siddurim in the first grade, are we saying that a relationship with God will only come at a later developmental stage for our children? While the adult siddur may be adequate for a tefillah program focused solely on tefillah literacy and skills acquisition, a childfriendly siddur can accomplish that and much more For example, the rubrics of an adult siddur are totally lost on a young child, written in developmentally inappropriate language. For the youngest children, struggling to read, pictorial rubrics would be more appropriate, and for older children, rubrics written in developmentally appropriate language are necessary. Other educational elements to help a child become familiar with the structure of tefillah, and the choreography of tefillah, would also be of great value to the tefillah educator, such as a navigation tool and an age appropriate guide to the laws governing tefillah. The typesetting of the siddur has educational implications. For example, having each berakhah of the Amidah on a separate page can help the student focus on it. The layout of the text, with appropriate structure, can help the student understand how the blessing is constructed. Navigation bar – This visual representation of the structure of the service can highlight the current location within the service (or within the siddur as a whole) helping the student to become familiar with the matbe’a tefillah and not feel lost at any given time during tefillah. Developmentally appropriate rubrics – The rubrics in a siddur are vital in learning the how of tefillah, including halakhot and the choreography of tefillah. For younger children to have these in visual form is engaging and effective, and while older children might also find visual rubrics appealing, they may prefer written rubrics (feeling them to be more adult and closer to norms of the adult siddur) but it is vital they are written in developmentally appropriate language. 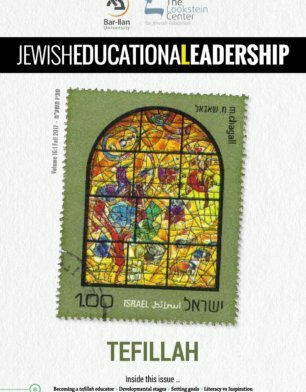 Reflection questions – Reflective questions, appropriate to the specific tefillah on the page (or to prayer in general), encourage the students to challenge themselves with the themes of the tefillot, and in this way connect to them and to God through them. Stories and other texts – Stories, quotes, explanations, philosophical and halakhic sources, presented in developmentally appropriate language, can help the student to connect to the themes and meaning behind the texts of tefillah, and encourage their thinking to deepen and progress in further directions. Images – Illustrations and photographs can be presented as a visual commentary on the text of the tefillot. More than just making the siddur aesthetically engaging and attractive, these can be powerful educational resources, as much as any text or narrative. Translation – Most standard translations of the siddur use language that is not much easier for students than the Hebrew, and can be more a distraction to understanding the liturgy rather than an aid. From a pedagogical standpoint, for younger children translations should relate to the themes of the texts rather than to the literal understanding of the texts themselves; literal translation should be reserved for older students who will not become overwhelmed by it and even then, the translation must only contain developmentally appropriate words. Room for creative midrash/student commentary – Empowering the students to create their own meaning and understanding of their ancestral texts makes educational sense, and this should include liturgy. Allowing space on the page for this is a meaningful statement of empowerment and partnership. Tefillah literacy emphasizes, at best, half, and perhaps the less important half. To ensure long term student engagement in tefillah we must facilitate opportunities for connection and meaning-making from the earliest age, including opportunities for spiritual development, and connecting to and conversation about and with God. And the right kind of siddur can make a tremendous difference in encouraging our students to explore the essence of tefillah – building a meaningful relationship with God. Goldberg, S. (2014). Where’s God? : Educating children for tefillah through preparation, prayer, and questions. In, From Within the Tent: The Weekday Prayers Essays from the Rabbis and Professors of Yeshiva University. Jerusalem: Maggid Books. Goldmintz, J. (2010). 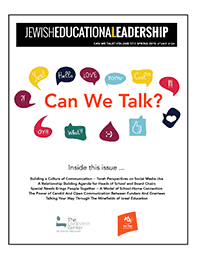 Helping students find their own voice in tefillah: A conceptual framework for teachers. Retrieved from www.lookstein.org/ professional-dev/helping-students-find-voice-tefillahh-conceptualframework- teachers/. Golombek, E. (2011). Engaging souls: Bringing elementary tefillah to life. Retrieved from www.lookstein.org/professional-dev/engaging-soulsbringing- elementary-tefillah-life/. Greninger, N. M. (2010). Believing, behaving, belonging: Tefillah education in the 21stcentury. Journal of Jewish Education (76)4. Lehmann, D. (2010). Student and teacher responses to prayer at a Modern Orthodox Jewish high school. Religious Education (105)3. Sigel, D. (2016). Prayer and adolescence: Can formal instruction make a difference?, Religious Education (111)2. Wachs, S. P. (2009). Towards a theory of practice: Conducting services for and with children and teens in Jewish day schools. New York: Solomon Schechter Day School Association. Wachs, S. P. (2012). Teenagers, Spirituality and Prayer in the Jewish Community Secondary Day School. CreateSpace Independent Publishing Platform. Daniel Rose is the Director of Education at Aardvark Israel. Dr. Rose was previously Director of Educational Projects at Koren Publishers, where he was editor for the Koren Magerman Educational Siddur Series.